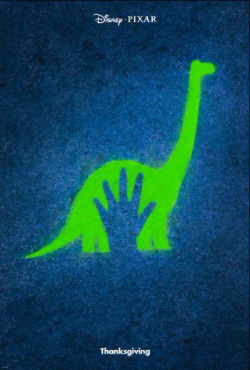 NJ Kids Movie Review: ‘The Good Dinosaur’ – Really, Disney Pixar? Seriously, Disney Pixar? Another kids’ movie with a missing parent? Kids these days are going to grow up thinking it’s the norm for one or both parents to die, often in a tragic accident. Yes, I realize this is not new (see “Bambi,” “The Lion King,” “Finding Nemo,” yada yada). I say enough with the missing parents! I’m challenging you right here and now to make a movie where both parents are alive at the beginning AND end of the movie. Let parents live! Aside from my utter disdain over that plot point in “The Good Dinosaur,” there are plenty of good things to like about this animated movie directed by Peter Sohn. The story puts a twist on what we learned in school about our planet. That asteroid that hit Earth and wiped out the dinosaurs? Never happened. So the dinosaurs never became extinct. Oh no, they’re farming the land and growing corn! When a young farm-family dino named Arlo (voiced by Raymond Ochoa) loses his father (Jeffrey Right) in a freak accident, he ends up far from home and teaming up with a young human he names “Spot.” As the two travel the harsh landscape to get Arlo back home to his mom and siblings, they both learn to face their fears and embrace their strengths. Aside from the “missing parent” theme, “The Good Dinosaur” features Disney Pixar’s gorgeous landscapes and visuals, as well as the voice talent of Frances McDormand, Anna Paquin and Steve Zahn. PARENT INFO: “The Good Dinosaur” includes strong themes of loyalty and bravery, as well as many scenes of peril, trauma, grief and danger which might frighten kids. I’m going with ages 7 and older on this one. A parent dies and the son is swept away to a strange landscape where he must make his way back home, while battling storms, sharp-toothed beasts, and hallucinations (yes, really) after eating fermented fruit.